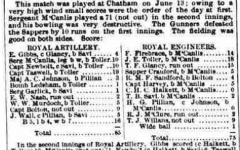 A match of cricket was played at Chatham, a non-official Sapper-Gunner match. The start of a great rivalry perhaps? The first Sapper v. Gunner game at Woolwich ended with no outright winner, a draw. Played at Woolwich, the rivalry was beginning to take shape but alas another draw was on the cards. Match number 3 finally had a victor and unfortunately for us it was the Royal Artillery that were the victors, winning by 126 runs. The 4th instalment of the Sapper Gunner classic slumped to a not so exciting draw at Chatham. Played at Woolwich, after the dull draw at Chatham, we were after a result but alas another draw was in-store. The RECC, was started as an officers’ club, and the fact that we chose quite regularly to play soldiers in our team was a bone of contention. Only once prior to 1939 did the Sappers include a soldier player in their side. We can trace our clubs history back to as far as 1862, but cricket matches involving the Engineers were being played throughout the 18th century. It wasn’t until 1875 that the Royal Engineers Cricket Club became what it is today, a club for the Corps. 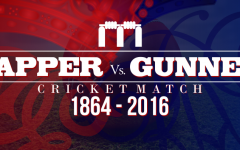 The first Sapper-Gunner match was played at Woolwich in 1864. Thereafter until 1906 there were 2 matches each year, one at Woolwich and one at Chatham. 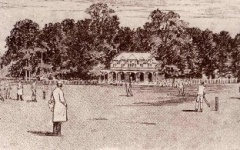 Then from 1907 it was reduced to one match, which, at the invitation of MCC, was played at Lord’s. This continued until 1962, except for the war years when there were no matches, and 1946, when the match was played at Aldershot. After 1962 it was played alternately at Woolwich and Chatham until Larkhill replaced Woolwich in 2003 as the RACC ground.